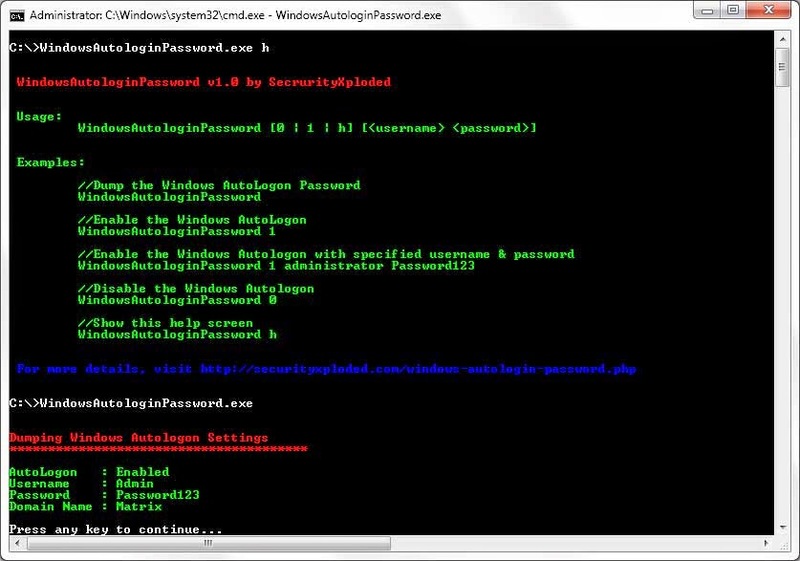 Windows Autologin Password is the free command-line tool to quickly dump and manage the Windows Automatic Logon Password. Automatic Logon is one of the useful feature in Windows which allows you to login to system automatically without entering the password everytime. This tool helps you to easily dump the current Autologon password as well as quickly change the Autologon settings with just one command. Specify your Username & Password for Windows Auto Logon. Once you set the Auto Logon username & password, you have to restart and next time you will be logged in automatically. It is simple & easy to use tool. Also being a command-line based tool makes it perfect for automation. 'Windows Autologin Password' works on both both 32 bit & 64 bit versions and tested successfully on all Windows Platforms starting from Windows XP to latest version, Windows 8.